DC’s Legends of Tomorrow takes a break from exploring the past and gives us a possible future with the team stuck in a post-Apocalyptic Star City in the year 2046. I enjoy time travel stories in concept –if not always in execution- so exploring a possible future is something that really interests me but the trick is to not make it a disposable entry. In the best cases seeing the possible future can inspire the characters to take corrective measures in their own present to make sure it never comes to pass. Unfortunately this episode completely drops the ball on making any of this relevant or worthwhile as Rip constantly reminds the team –and the viewer- that this future is only a possibility that can be altered by taking action in the past. As a result there are almost no stakes as this will never come to pass. Sara is the one most affected by seeing the city she calls home devastated. This makes sense as she spent a long time protecting those people as Black Canary so feels a personal connection to it and a large degree of responsibility for what has happened to it. This is multiplied by the fact that she is told this might not have happened had she been there to help. She takes it upon herself to do what she can to save the city at this point and make up for her not being there when it was really important. After hearing that he actions here wouldn’t necessarily matter but could in the past she decides to go off and do what she can anyway. Her determination is admirable and her personal connection goes some of the way towards giving the episode measurable stakes but it isn’t quite enough to make it all feel like much more than a diversion. Sara spends much of her time interacting with the Green Arrow of this time. 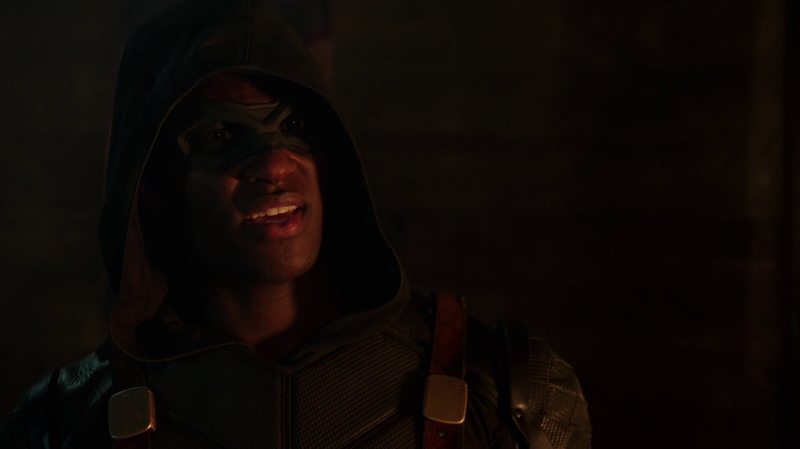 He goes by Connor Hawke but his real name is actually John Diggle Jr. (Joseph David-Jones). Why he chose this name is flimsy at best as he mentions seeing his father die and not feeling worthy of his name. It doesn’t really work as there’s no real sense of failure to him nor any reason given why the name he chose is significant. It could be in the backstory but the episode never explores it so using Connor Hawke seems like a way to reference the comics rather than have any measurable story reason behind it. The Diggle lineage is a good change from Connor being Oliver’s son. Oliver would feel a sense of responsibility to Diggle’s children in the same way he would his own biological children so it works from a father/son and mentor/mentee perspective as well as adding more diversity to the mix. I’m glad that making Connor Diggle’s son was the decision as using Oliver’s son William would have essentially been the same story but without the racial diversity. 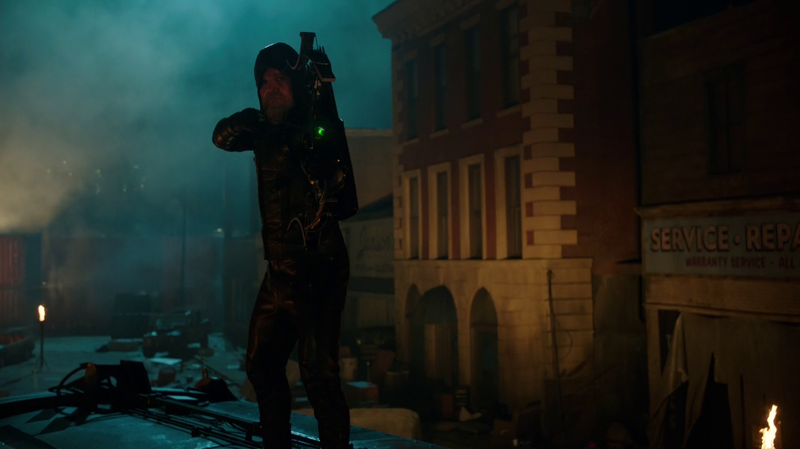 Oliver Queen is still alive in this future but he is an old man made bitter by defeat and loss. He spends his time hiding out in his former headquarters and taking no interest in saving the city. Stephen Amell does a good job of aging Oliver’s voice and it’s interesting to see him at his lowest point after giving up on his mission to save his city. One thing that has been consistent in Arrow is that no matter how bad things get Oliver is always fully committed to protecting people and standing up for his city. Seeing him turn his back on everything he once stood for is a morbid thought and Amell’s performance completely sells it despite some ropey old age makeup. Unfortunately there is also nothing in Amell’s physical performance to suggest that he is any older than we are used to. He fights like a young man with no noticeable dip in the quality of his skills. I imagine trying to make yourself a little worse at combat but still be effective is really difficult but some attempt should have been made. The cause of the devastation is the new Deathstroke. He is the son of the old Deathstroke and goes by Grant Wilson (Jaime Andrew Cutler). 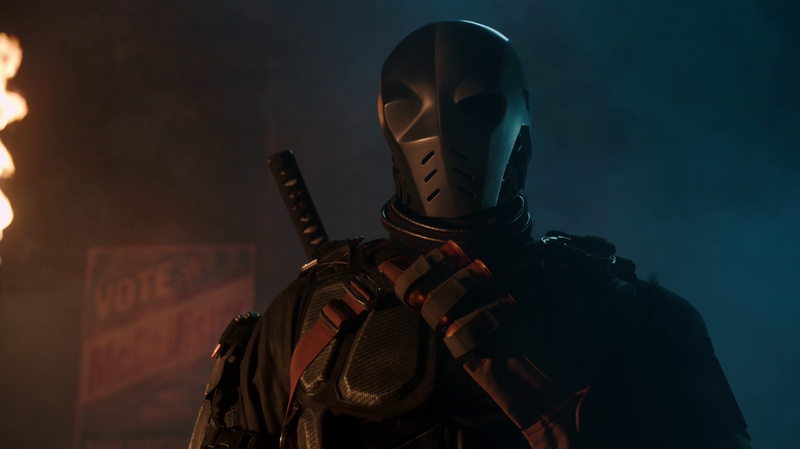 He seems a little young to have attacked Star City 15 years before this but has a solid presence and a formidable physicality that makes him believable as the son of the original Deathstroke. His appearances in the episode are brief but memorable and he is already a more engaging villain than Vandal Savage. Mick and Snart find themselves in what they would once have considered the perfect world. Mick fits right in and becomes leader of a gang of criminals so has every intention to stay in this paradise. Snart feels differently and constantly reminds him that their teammates are in danger. His world view has slowly been changing since the start of the season and this is the first time Mick has noticed it which brings them into conflict over their priorities and Mick finds that he doesn’t understand his world any more. 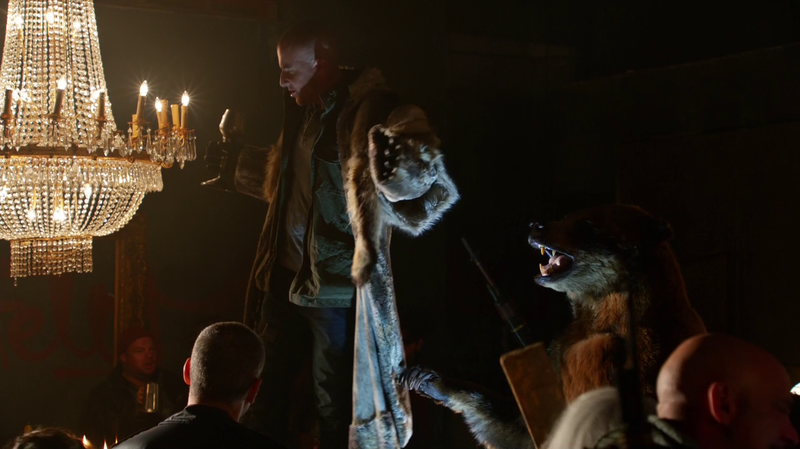 Snart is developing a sense of belonging to the team and finds that being a criminal isn’t enough for him anymore. Mick will have to figure out his own priorities and that should create some interesting dramatic possibilities over the coming episodes. A frustrating love triangle forms in this episode between Jax, Ray and Kendra. Both men are vying for Kendra’s affections and Stein functions as a wingman for Jax who tries to steer Ray away from Kendra. His attempt has the opposite effect and has Ray think about something he hadn’t previously considered. The whole thing is really dull but does bring some welcome levity to what was otherwise a fairly dark episode. I did like how the psychic connection between Jax and Stein was used. Casting Kendra as an object of affection for two men does nothing to further develop her. She has been sitting on the side-lines since the season began and has always been defined by her connection to a man so having a story where that happens again is far from idea from a development point of view. At least Kendra tells Ray that she doesn’t want to add any more complications to an already insane situation so that hopefully nips the love triangle in the bud and removes it from future stories. I’m a broken record on this issue but I can’t stand love triangles as they are an overused trope. Hopefully with this out of the way Kendra can stop reminding us that she was a Barista only a few months ago and actually start feeding into the emerging group dynamic a lot more. The design of the devastated Star City reminded me of John Carpenter’s Escape from New York. It looked a little cheap and the locations were really confined but it got the point across. As usual Star City is only seen in the dark so that hides a lot of the clunky set design. An uneven episode that fails to explore the future Star City as extensively as it could have and removes most of the potential to raise the stakes by stating that this is only a possible future. The whole message that it doesn’t matter makes it impossible to be invested. Mick and Snart’s conflict over their priorities was the strongest aspect of the story and Stephen Amell delivered an engaging performance as an old bitter Oliver Queen.